A seven-alarm fire tore through several buildings in New York City's East Village on Thursday, leaving at least 19 people injured -- four of them in critical condition. Soon after the explosion occurred, dramatic images began surfacing showing flames shooting out of the building's rooftop. Officials said that four buildings have been affected by the fire and two of them have partially collapsed. A third structure is in danger of collapsing as well. The incident is suspected to be a gas-related explosion that started at 121 2nd Avenue in East Village, though an investigation is still ongoing. 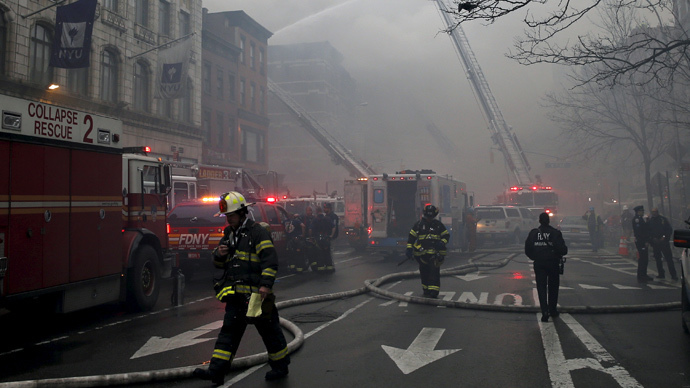 More than 200 New York City firefighters arrived at the scene in order to combat the flames. Down in the streets, firefighters worked to draw water as fast as possible. Firefighters are expected to work long into the night. Responding firefighters quickly clogged the East Village streets, moving people out of a possible building collapse zone. Visibility in the area was also extremely low, and there was so much smoke that it drifted at least 40 blocks north. One rescue attempt was even caught on video.